Lush evocative presentation, a fitting backdrop for a very cinematic game. 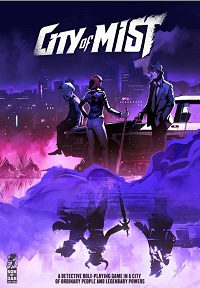 Publisher's blurb: "Take the role of gritty detectives and unscrupulous city folk wielding mythical powers in this award-winning tabletop role-playing game. Investigate crimes committed by modern-day legends as you struggle to balance the legend inside you with your everyday life. "Packed with beautiful graphic novel art and masterfully designed to give your game a dark gritty feel, the Core Book is the complete City of Mist guide"